I never hated moving to a new house. It was always exciting to me, the very thought of change. The possibilities of a new place, new space, new friends, new view. It always seemed like a blank canvass, with the potential to fill it with anything you loved, anything you imagined. Of course as a kid with no access to money, it fell upon imagination to make up for it. 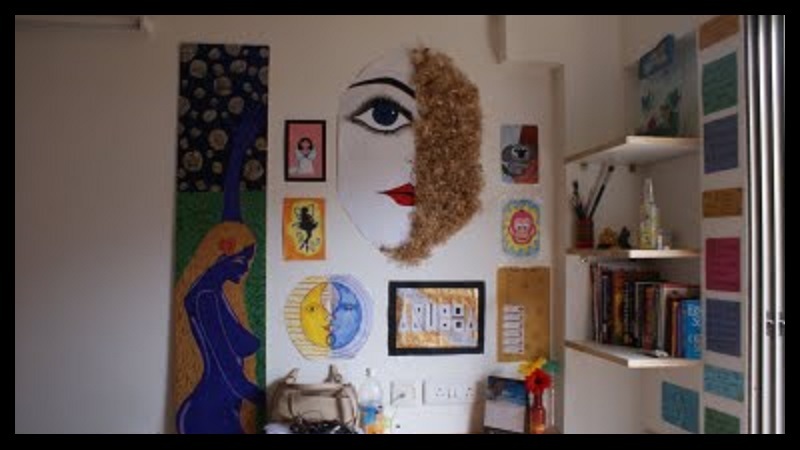 I went through all kinds of phases, from loving tents, to adorning my walls with fairies to deciding I preferred an eclectic ceiling of kites and to finally painting a wall mural on the night before my board exams. It was always fun, even more fun was the idea that my room fixtures were not permanent, not expensive and could be taken down anytime I wished to do something new in its place. The wall mural painted during my school days. College happened and the hostels again provided empty rooms with basic furnishing, which again turned to be this great opportunity to do something fun with my time. I liked colours, and looked around for scrap that I could convert as decor for my room. From asking the carpenter at the college, to give me useless pieces of wood planks, to collecting wood scrap and painting perfectly curled twigs, I again found that I need only a little imagination and some painting material to make my room look warm for me. To create a space , where I could de-stress. Sometimes looking back on these images, I’m reminded of how much more free I was while studying , to do all the fun pastimes, that did not reward with money, but was so satisfying. 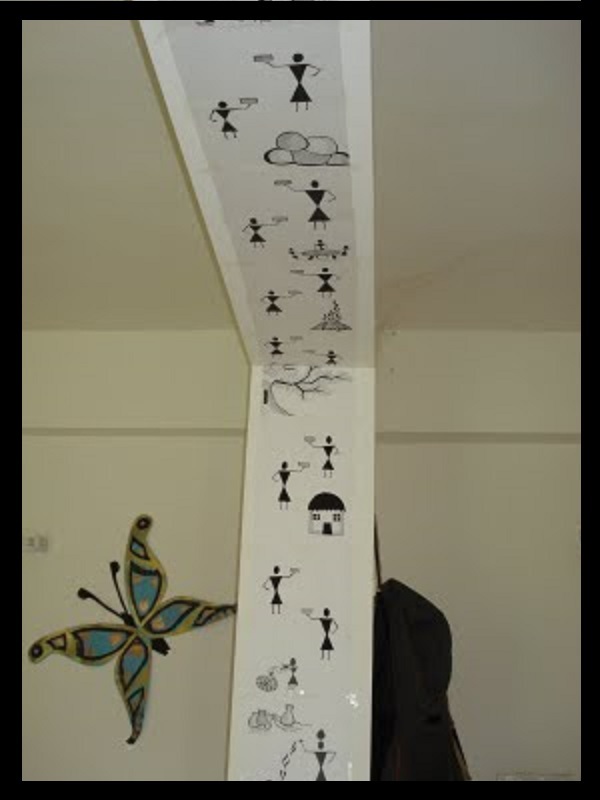 My hostel room, with each day’s pastime just put up there 😀 And below is the warli art done on A4 sheets of paper which was then transferred one by one to the beam running across the room to make it look as if it were painted there. Though it was just one room I wanted different areas charted out, like the writing-table zone, the diwan area and the bed & dressing. 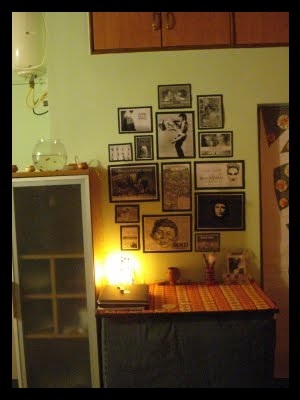 The images above the table are b&w printouts stuck on black chart paper for that framed effect. A nice rug on the table from @home. 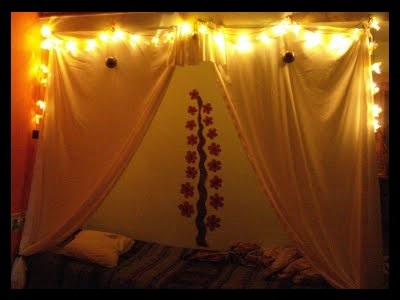 The bed area, a tent setting to provide that sense of separation from the rest of the room, a little wall mural and string lights add cheer. 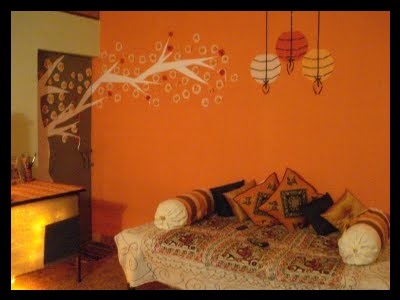 The living area, with a simple diwan and the wall sporting a tree paper mural. 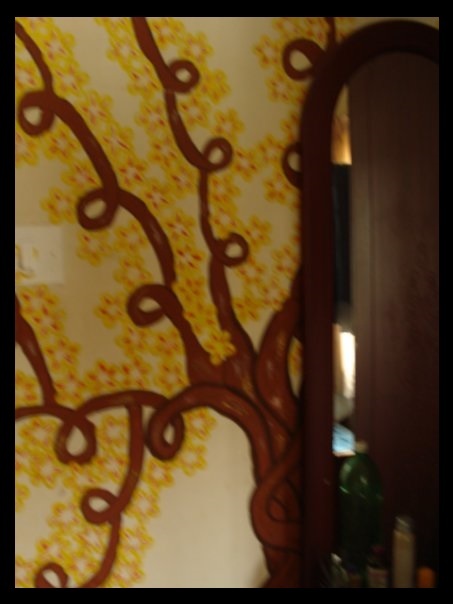 The idea for the mural started with the metal door provided as the toilet door, it was terribly out of place. The tree starting there and flowing across the accent wall in the room added the needed pinch of fun. But all of this was child’s play, easy, low on budget and high on fun. Now my husband and myself have moved into our own new home, 6 months back. We moved into an empty shell, with nothing except our clothes in a carton and doing up this space to be a very personal zone for us took more than imagination. It took time, coming up with a well-defined budget, plenty of resource hunting, choosing, shopping and endless discussions on what reflected our lifestyle and taste best. I will be sharing what we have done with our new home in the next couple of blogs. Meanwhile, maybe you could try a DIY wall mural project. You can also buy a wall decal that you love from a wide range of ready-to-stick available across various online portals. However I recommend doing it yourself, its a lot more fun and something completely you!